Hundreds of Kosovar Albanians blocked access to a village due to be visited by Serbian President Aleksandar Vucic Sunday, an AFP journalist said, as a festering row over Kosovo independence clouds hopes that the war foes can normalise relations. Demonstrators used vehicles and tree trunks to create a barricade on the main road between Mitrovica, in the north of Kosovo, and the village of Banje, a Serbian enclave some 60 kilometres (40 miles) away. "Vucic does not pass" and "Those who committed genocide against innocent civilians cannot pass" read messages on placards at the blockade, which according to Serbian state television RTS was one of five set up by protesters to cut off all road access to Banje. 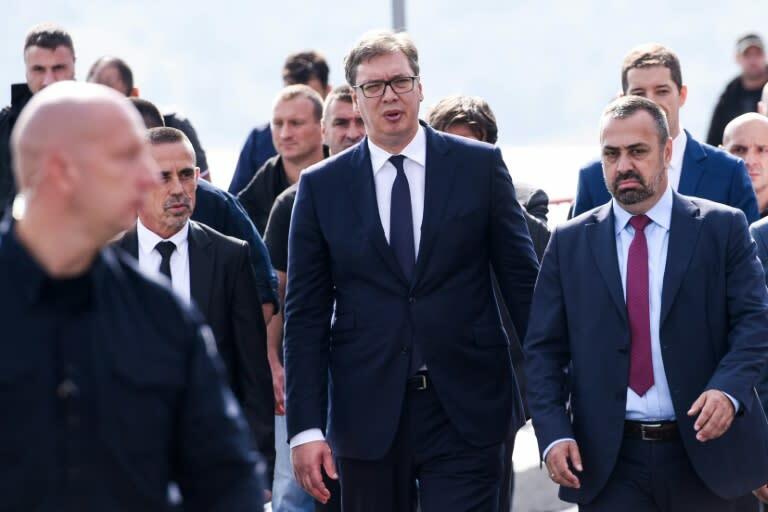 According to RTS, Vucic's route was blocked by former members of the Kosovo Liberation Army, the pro-independence guerrilla movement that fought Serb armed forces in the conflict. The Serbian president is making a two-day visit to Kosovo, just days after planned talks with Kosovo president Hashim Thaci in Brussels under EU auspices fell apart at the last minute. The talks have been stalled for months but started generating attention in recent months after Thaci and Vucic signalled an openness to the idea of border changes to resolve their longstanding differences over Kosovo's independence. The presidents have not laid out any detailed plans but the talk has alarmed critics, who say redrawing the map of the Balkans could wreak havoc in a fragile region scarred by war. Vucic is due to speak at a public event later Sunday in Serb-majority Mitrovica. Serbia needs a deal with Pristina to move forward in EU accession talks, while Kosovo is hoping that recognition from Belgrade that would unlock its path into the United Nations. Kosovo is recognised by more than 110 countries, but outliers include Russia, China and five EU countries, including Spain, which does not want to set an independence precedent for its own regions.